Here at Official Aspire, we supply a wide range of Aspire hardware – satisfying the needs of vapers worldwide. We also have products available for wholesale, so if you’re a vendor looking for top quality supplies, look no further. This section covers the K series tanks which you can now purchase as standalone products. 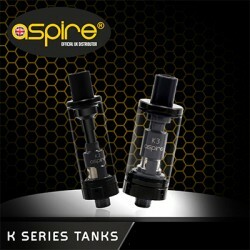 The K1, K1 Plus, K2 & K3 tanks are all available here. But please note, if you are looking for the K4 tank this is a Cleito. Aspire are dedicated to quality and innovation and leading the way in the vaping industry, they supply the K series to provide a healthier alternative to tobacco. Our K series tanks are revolutionary. They are part of the latest generation of Aspire hardware and incorporate modern technology. They are designed to last longer and guarantee clean, pure flavours from e liquids too. We supply them in several variations to meet the growing demands for mouth to lung (MTL) vaping. Our Aspire K series tanks stimulate the sensation of smoking, which explains why they are the preferred option for beginners. The tanks below are designed to mimic the smoking experience but provide fewer harmful consequences. At Official Aspire, we supply the K1,K1 +, K2 and K3. They all incorporate BVC technology, which makes them suitable for VG and PG e liquids. The K1 tank is designed to look exquisite and offers longevity and versatility. You can fill it with any e liquid and the tank won’t crack – it’s perfect for everyday vapers. When choosing a tank that’s affordable and easy to use, you cannot go wrong with the Aspire K1 tank. Or, of course, the latest K1 plus. For those who are new to vaping, we recommend the Aspire K2 and K3 tanks. The Aspire K2 tank is a must-have for MTL vapers and high-strength e liquids. It has a capacity of 1.8ml and is compatible with various BVC coils. The K3 tank is also suitable for beginners as it’s easy to carry, install and refill. The Aspire K3 tank uses the same coils as the Nautilus tank - which are also available, here at Official Aspire - making it easy for you to find appropriate replacements. If you need to know more about the Aspire K series tanks that we supply, call us on 0333 577 5002 and our team of Aspire experts will be more than happy to help.